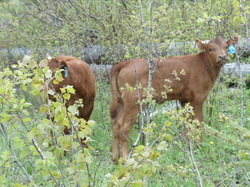 Welcome to the Zirnhelt Ranch, a family owned and operated ranch located in Beaver Valley BC. Beaver Valley is a lush agricultural oasis located in the western foothills of the Cariboo Mountains near the city of Williams Lake. The climate is ideally suited for grazing cattle on fertile pastures and producing high quality hay. We believe that our 100% grass fed beef is healthier because it is leaner and has a better composition of vitamins and nutrients. In particular, grass fed beef is higher in Omega 3’s, which current research describes as a health promoting fatty acid or “the good fat”. We are working with the Thompson Rivers University and other local beef producers on enhancing the levels of the good (omega3) in our grass fed beef. By direct marketing our grass fed beef, we are able to sell it at a cost which is competitive with prices in grocery stores. We sell our beef as a whole animal, by the side, or as a mixed quarter. We invite you to visit our farm to learn more about our farming practices and lifestyle which support the production of your grass fed beef purchase. Thank you for making the choice to buy a product that we believe is more in tune with nature and healthier for you, your family and the animal.